It wasn’t the best week to have so I really looked forward to a nice dinner and a relaxing weekend. I got home to find that there was very little in the way of ideas to start dinner. Arrgh! It wasn’t ‘pizza night’ so I doubted that I would get away with that. Tuesday is pizza night. Anyway, off I went ramaging through my fridge and that’s when the sketelon of a very yummy meal began to form. It all started with (1) a bag of spaghetti. I needed a whole bag because if my instincts where anything to go by, there was going to be plate- licking. I let the spag boil while I continued my quest for the perfect ingredients. Then, in the fridge I found (2) yellow & green peppers (deserted from last weekend’s egg stew), (3) a ‘Nando marinate’ (HOT)….’Absolutely,’ I was thinking, ‘But I need a meat of some kind…’ Aha! 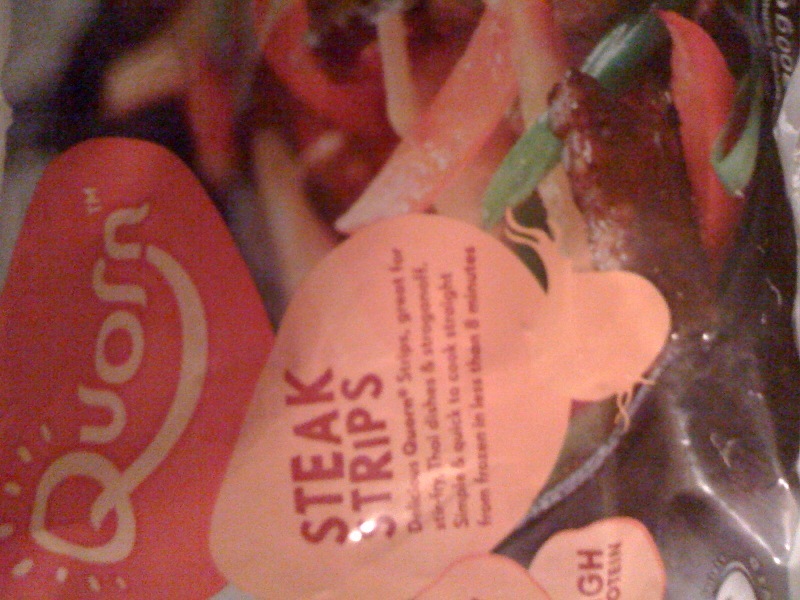 There in the freezer was (4) Quorn Steak strips! Awesome! I could never figure what to use that for but it seemed like a good idea when I bought, especially with kids (and hubby) that LOVE meat. So, it was working well. I put a touch of olive oil in a frying pan and stir-fried the steak strips as I poured in the Nando sauce. With the heat low, I chopped the peppers (5) and some onions into the steak strips. 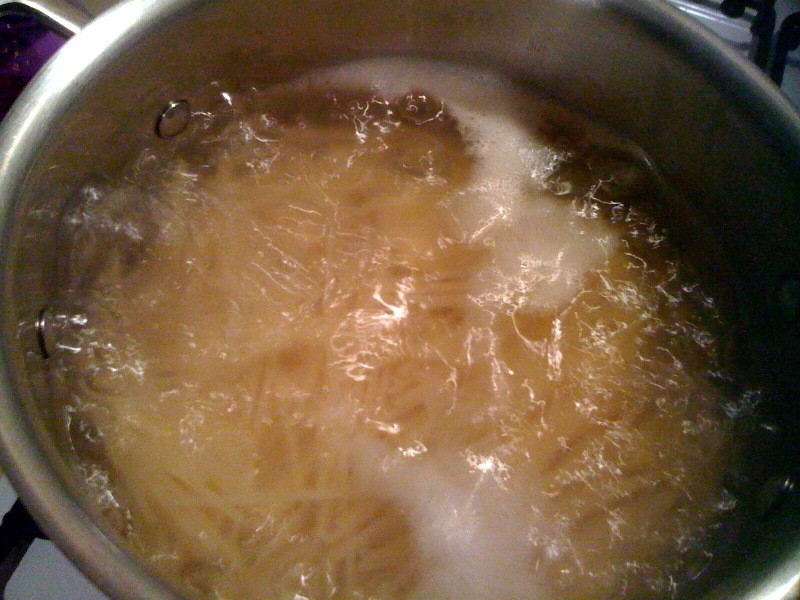 The spaghetti was then ready to be drained. I couldn’t believe that this meal was going to take me less than half an hour to knock together! And it looked divine. I blended (6) some tomatoes and pepper to add to the spaghetti after I drained it and put it back on the heat. I added some salt, crayfish and garlic. And voila, I had a meal ready before my hubby was back from work! What’s the big deal? Well, I had a rotten end to my week and when this happens, it gets me great confidence to make “something out of nothing” at home. When I feel like it’s not working out in whatever role I’m improvising during the week, it helps to be the greatest cook (daydream) or wife or mother. I must say the meal WAS delicious and it helped put other dilemmas at bay for the evening. One victory for womanhood, I’d say. « Make me, Break me. Looks delicious!!! A real victory for womanhood if I must agree! Emergency meals, i always call them, and they always turn out better. sounds delicious with the blend of crayfish flavour. well done! Your coconut rice recipe is still a standard for me. It holds an honorary post on my kitchen notice board.